A pioneering Sri Lankan education institute with 16 years in the field, the International Institute of Health Science (IIHS) has opened four learning centres in key regions of Sri Lanka to offer greater access to much-needed nursing education locally, in partnership with Open University Malaysia (OUM). Recognising the need to provide affordable, accessible education for all nurses, IIHS recently commissioned the Uva Province Learning Centre in Badulla, Central Province Learning Centre in Kandy, Southern Province Learning Centre in Galle and North Central Province Learning Centre in Anuradhapura. Nursing programs that are available at these centres range from certificates to degrees, even going so far as providing pathways to earn PhDs. Most important of all, these programs deliver foreign degrees at local prices, without sacrificing the high international standards of education for which IIHS is known. IIHS’s longstanding partnership with OUM has enabled it to offer international degrees to Sri Lankan nurses wishing to upgrade their nursing diplomas. 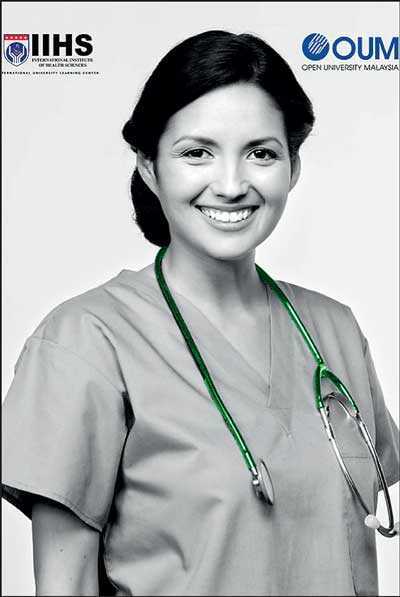 There are more than 1,200 Sri Lankan and 60 Maldivian student nurses currently enrolled in the IIHS OUM Nursing Degree program, with approximately 100 nurses graduating from its Bachelor’s in Nursing and close to 20 senior nurses earning a Master’s in Nursing every year. To date, over 300 Sri Lankan nurses have graduated from this program since UOM first partnered with IIHS in 2010 to provide its joint Bachelor’s in Nursing (Hons) program for Sri Lanka’s nurses. Students who have completed the degree have excelled locally and internationally. IIHS has plans to provide access to education for upwards of 3,000 local nurses by 2020, which is roughly 10% of the entire pool of nurses in Sri Lanka. Formed by 11 state universities in Malaysia, OUM’s programs are well accepted among all Commonwealth countries, providing greater employment opportunities to graduates. OUM Bachelor’s in Nursing degrees are recognised locally by the University Grants Commission (UGC), and provide international pathways to Nursing-related Master’s and PhD programs in Australia and Europe. Further, these programs, which are only available via IIHS in Sri Lanka, include access to international libraries as well as readings and other related curriculum for its students. IIHS delivers these programs through its world-renown, Commonwealth Award-winning Learner Management System, which has immeasurably enhanced the deployment of education in Sri Lanka. Through this platform, students have access to information digitally irrespective of their location, which also encompasses essential international e-libraries. “The founders of IIHS built the institute with the vision to export skilled labour. Over the years through our solid international partnerships, IIHS was transformed into an International University Learning Centre (IULC) where foreign programs are delivered effectively in Sri Lanka. Due to its accessibility and quality programs, IIHS developed into a regional hub for education. In the most recent attempt to transform the regional landscape, IIHS is now expanding its education to the region by exporting education,” stated IIHS CEO/Director of Academics Dr. Kithsiri Edirisinghe. As Sri Lanka’s premier International University Learning Centre (IULC), IIHS has for 16 years offered programs ranging from Certificates to PhDs. As a well-respected IULC, the programs offered at IIHS are done so in partnership with leading global universities with which IIHS has secured pathway opportunities for students to achieve their international dreams at a cost-effective price. For a nominal price, IIHS provides students are provided with the opportunity to receive a quality education and be a globetrotter while achieving a promised return of investment through ample job opportunities. IIHS provides a comfortable learning environment, which understands and nurtures student-centricity. The importance of student-centricity has been highlighted in international education delivery standards, where teachers ought to move away from the traditional teaching methods, which draw upon a teacher-centric classroom. The faculty of IIHS consists of experienced, yet youthful, staff who arm students with a range of qualities and values, which keep them up-to-date on modern trends and learning styles. Valuing a SMART learning environment, with a continuously upgraded curriculum through the input of its partners and aligned with international trends in education and teaching, IIHS produced the first Collaborative Teaching in environment in South Asia – a system which supports learning outcomes whilst students are provided with ownership of their learning experience. IIHS prides itself on being the No. 1 in terms of Research, Evidence Based Practice and Reflective Practice arming students with a skill set to understand innovative and unique trends in healthcare. Further, students during their time at IIHS engage in multiple Community Projects so they build empathy and learn about existing local and international healthcare issues at a community level. Contact Nadeeka on 0114651144/0711660441 or nadeeka@iihsciences.edu.lk to request more information on this or any other IIHS program.